The unique positioning of the bling-covered cross and the double chains gets this Bling Cross Necklace noticed! Snap in the Dot of your choice to add a pop of color for even more interest! Truly a classic with love of my Mighty Saviour God, to wear all the time! This is beautiful - the bling and the cross - what a great combination to show our Love to God and our love of beautiful jewelry and fashion. This is gorgeous! 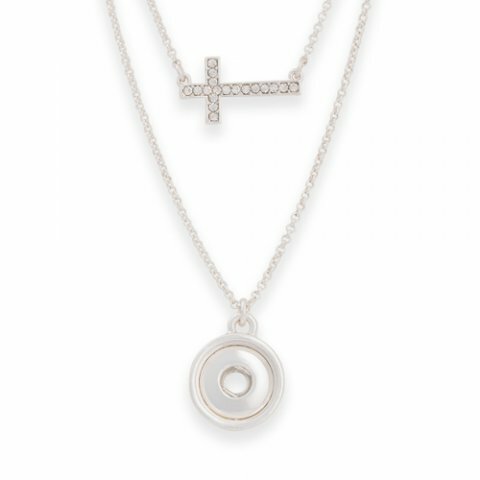 I love showing praise to my God in a simple, beautiful way by wearing this Bling Cross Necklace. I love how the cross sits more along a choker neckline with the Dot hanging lower. Along with being able to dress up or down the necklace by choosing a Dot that I love. I fell in love at first sight with the Bling Cross Necklace! Perfect length! !